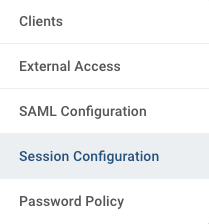 It is in the Session Configuration tab of the Admin application, you can set the number of minutes a session will last before the user must login again. Note: Users with ADMIN, SUPERUSER, and ACCOUNT priviliges can acccess this tab/feature. ID Read-only. The auto-generated ID of the session configuration. Client The client or app on which the session configuration is being applied. Please refer to the Client Ids table below for more information. If no selection is made, the session configuration will be applicable for all apps. If necessary, different session configurations can be made for each client. Expiration (minutes) Required. The number in minutes the session will last before expiring. The deault session time is 720 minutes. Prolong Session Yes or No. Default no. By selecting yes, the application will prompt the user to prolong the session before expiring. Maximum Prolongation (minutes) If Yes in the Prolong Session field, the number of minutes for which the session will be prolonged.